Time4Learning values your privacy. We will never sell or distribute you information. Time4Learning has a dynamic group of families who help us stay in touch with the wants and needs of the homeschool community. We listen, learn, and collaborate with our members on projects intended to improve the homeschool experience. This guide is one example of many tools we’ve built, based on that collaboration. This Welcome to Homeschooling Guide has one purpose: to provide tools, tips, resources, and advice from seasoned homeschoolers intended to help newbies answer the basic question– “How do I start?” It’s meant to help you find your own starting point and build a foundation of working knowledge as you embark on your homeschooling journey. We hope that you and your family enjoy this tool as much as we’ve enjoyed creating it! Since opening Time4Learning in 2004, we’ve spoken with thousands of parents who choose homeschooling for many different reasons. And regardless of the circumstances that led them there, we’ve observed that they all have at least one thing in common: they want what’s best for their children. If you are just entering the world of homeschooling, you’re probably feeling a little exhilarated, a bit unsure, and somewhat overwhelmed. You are not alone! It’s perfectly normal for new homeschoolers to feel this way at the beginning. It’s also normal to have an endless list of questions about the do’s, dont’s and how-to’s of homeschooling. 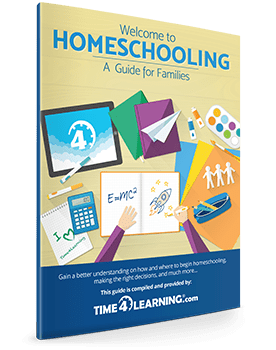 As a growing number of new homeschoolers called Time4Learning asking “how do I start?” it became clear that the question had not been answered elsewhere. Instead, parents were being bombarded with an endless array of curriculum descriptions, methodologies and wildly-enthusiastic websites offering information that doesn’t make sense without a working knowledge of the basics.